The world leader in military collectibles, military antiques and the militaria industry. 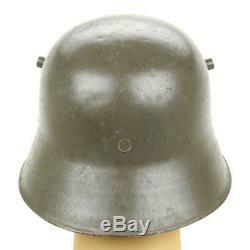 Original WWI Austro-Hungarian M17 Stahlhelm Steel Helmet - Size 64. 100% authentic WW1 manufacture with maker markings. Helmet Shell Size is 64 (liner size 57-58, US 7 1/8 - 7 1/4). The Central Powers of Austria-Hungary used, manufactured and commissioned, variations of the World War One German Stahlhelm M16 design. The Austrian M1917 helmet was similar to the German M1916, but had a few variations including the chinstrap,, chinstrap rivets located higher up on the steel shell and variations in locations of markings among others. Therefore, the provenance of these amazing nearly 100 year-old, helmets cannot be disputed. 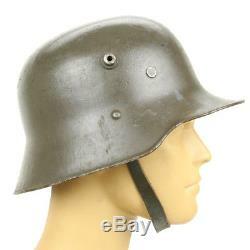 Early Austrian helmets were supplied by Germany, the first shells supplied as the chinstrap rivets were mounted in a lower position. The Austrians fitted their own chinstrap bales, chinstraps and liner and painted them in Austrian Isonzo braun. " These modifications were carried out with German machinery at the "Adolf Westen di Cilli factory, which is now Celije, in Slovenia. Ever helmet will be 100% original and will have the following notable features. Makers code with size marking 64 stamped on the interior of the shell. Makers codes vary (see chart below) and all will be genuine WW1! Correct original air ventilation lugs. 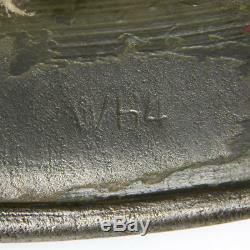 Rolling Mill dome stamp (under the paint) located on the outside (top) dome of every WWI Austrian M17 helmet you will find a heating lot code, these codes were used by the steel factories during production. These steel mills were called rolling mills. (see list of makers in chart below). 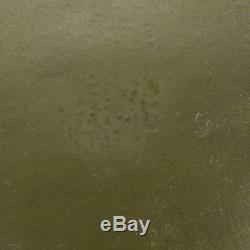 Genuine Military issue paint (most likely Finnish), colors will vary. Finnish made leather liner; styles vary between traditional WW1 three-pad type and post war Finnish style. A chinstrap mounted to the liner or directly the shell. 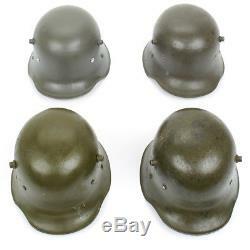 Please note these are genuine military issue helmets that were used in two world wars and in military service for more than 40 years. Every helmet will be free of any major issues, but please expect paint imperfections, scratches, minor rust spots, very minor dings or dents, etc. Sizing- Helmet Shell Size is 64 (liner size 57-58, US 7 1/8 - 7 1/4). A note on sizing- M1916 three-pad style liners being a bit more primitive than the later WW2 liners, allow for a wider size tolerance. Meaning simply, bigger heads fit into smaller helmet shell sizes than their WW2 counterparts. In each pad of the liner there is a pocket into which a padded "pillow" can be inserted. As such, helmets are slightly oversize. Without padding, a size 66 helmet shell can fit up to a size US 7 3/4 hat-size. With the 100-year anniversary of world war one here (August 2014) these helmets, offered in fantastic collectible condition, are a perfect additional to any collection! Austro-Hungarian WWI Helmets Makers- There are only 9 known factories that produced helmets during WWI for the KUK. 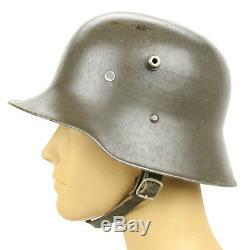 Unlike the Germans the Austrian pattern helmet are often found without factory stamps and heating lot codes. When the heating lot codes are present it is often on the outer top dome of the helmet instead of the inside. The following is a table of Manufactures codes of helmets produced by the Austrians. 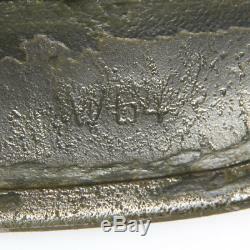 Several of these makers did not stamp the code into the shell of the helmet but rather marked them with an ink stamp. 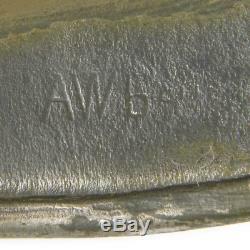 Therefore many Austrian shells will be encountered today that seem to have no maker mark as the ink stamp has worn off, but most will have rolling mill codes. Maker Name, Factory, Location, Maker code, Sizes, Model. Westen Cilli Celie, Slovenia, AW, 64, M17. Brauchbar, Brunn, BGB, 66, M17. Scholtz, Mateocz, Sloeakei, CAS, 66, M17. Berndorfer Metal-Warenfabrik, Berndorf, Austria "Bear" logo 66,64. Bleckmann & Poldihutte Klando, Boemia, Unknown, x, Stirnpanzer. Kapfen Austria, Stiria, GB "Star", 66, M17. WHAT YOU SEE IS NOT WHAT YOU GET! We display multiple images and write detailed descriptions of the products we sell in order to provide the customer with as much information as possible so you know what to expect when you open the box. However, most of our original antique items are not one-of-a-kind. Meaning the images you are viewing will not be the exact item that you will receive when you place your order. The images will, however, represent a typical example. In fact, the photos of products displayed on the website are never the very best examples of what we have. We make a concerted effort to photograph average examples of each product. This way, you can expect to receive an item that is at lest as good as the one photographed, unless specified otherwise. 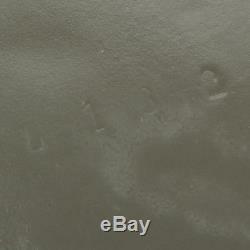 The only time you will get the exact item photographed is when an item is listed as? IMA Inc was founded by Christian Cranmer in 1981. In 2004, his son Alexander joined the business and together (with plenty of help from their magnificent staff) have grown IMA to become the world leader of the Military Collectibles, Military Antiques and the Militaria industry. We offer thousands of military antique items, including very rare original piecesning the past five centuries, as well as hard to find top quality new made reproductions. IMA supplied some of the world's foremost Military Museums, Film Productions (Saving Private Ryan), Collectors, and Re-enactors. However, most IMA customers are just everyday people that happen to share our passion for history. We are an American company with European roots. Our corporate offices are located in Gillette, New Jersey, less than one hour from New York City. Thank you very much for visiting. While the majority of orders will arrive on the estimated dates some orders may be delayed for various reasons. Please allow us the opportunity to resolve problems; we understand the concern and frustration you may have and will do our very best to resolve any and all issues. We want to make it easy. You DO NOT need a Return Authorization Number (RA#). Unaltered Condition means that no restoration, painting, major cleaning, or change of any kind has occurred. The return address label provided by IMA is not pre-paid. It is only an adhesive label with our correct address. We appreciate your patience and understanding. We will resolve your issue before either option is required- that is a promise. We will notify UPS about a pending claim. UPS claims can take up to four weeks, but typically are resolved sooner. We also maintain a secure database of customer addresses. If a mistake was made and IMA is responsible, we will correct it out of our cost. This listing is currently undergoing maintenance, we apologise for any inconvenience caused. 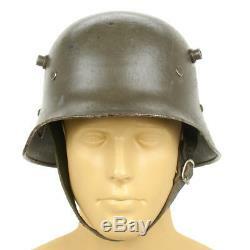 The item "Original WWI Austro-Hungarian M17 Stahlhelm Steel Helmet Size 64" is in sale since Tuesday, September 02, 2014. 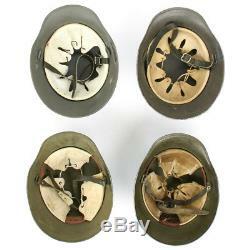 This item is in the category "Collectibles\Militaria\WW I (1914-18)\Original Period Items\Austria-Hungary". 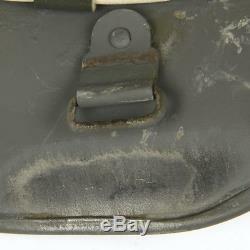 The seller is "international-military-antiques" and is located in Gillette, New Jersey. This item can be shipped to United States, Canada, United Kingdom, Denmark, Romania, Slovakia, Bulgaria, Czech republic, Finland, Hungary, Latvia, Lithuania, Malta, Estonia, Australia, Greece, Portugal, Cyprus, Slovenia, Japan, China, Sweden, South Korea, Indonesia, Taiwan, Thailand, Belgium, France, Hong Kong, Ireland, Netherlands, Poland, Spain, Italy, Germany, Austria, Russian federation, Israel, Mexico, New Zealand, Philippines, Singapore, Switzerland, Norway, Saudi arabia, Ukraine, United arab emirates, Qatar, Kuwait, Bahrain, Croatia, Chile, Colombia, Costa rica, Panama, Trinidad and tobago, Guatemala, Honduras, Jamaica.